For the next four days I'm going to be in Indianapolis. 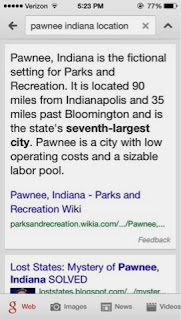 Or as I've been calling it, the Vegas of the Midwest. It hasn't caught on yet but here's hoping. I did expect to get off the plane and see Tom Haverford waiting to greet me. 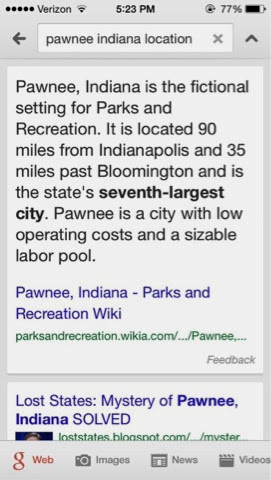 After all according to "Parks and Rec" it was only 90 mins away from Indianapolis. Naturally I looked it up to confirm because CLEARLY there's gotta be some amazing tours and at least one "Treat Yoself" shrine. But alas my world was shattered when I googled its exact location. Yep that's right. The town that is first and friendship and fourth in obesity is not a real place. My despair turned into intrigue when I passed a room in the conference center named "Wabash." For some reason it rang a bell. Why you might ask? It is the correctional facility consistently featured on "Lock Up," errrrrry Friday and Saturday night. Maybe I looked it up to see how far away it was. Maybe I didn't. I did. 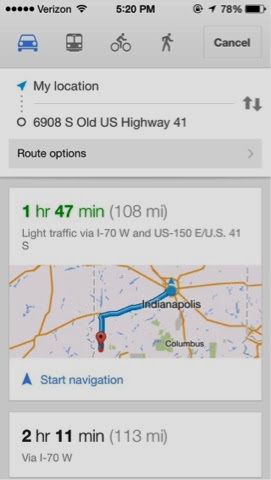 It's an hour and 47 mins away. A little too far for a field trip. I also wouldn't know what to do when I got there...ask the warden for an autograph? Ask around to see if "Shawshank" had any validity to it. I need to start some accounting classes stat. And make friends with Morgan Freeman so we can meet at a beach and hang out on my boat. Although I've had a few highs and lows since I arrived in Indy 4 hours ago. I'm pretty impressed with the place. Currently there is a dance competition and gaming conference going on in the same convention center and it has already provided me with prime people watching. Also the trends here are...in a word...phenomenal. I wasn't really aware that sequin Ugg boots were as fashion forward, but the few hours I've been in Indiana have proved me otherwise. With that I must fly. I have boots to buy. 96 days of blogging to go. Welcome to Indy!! You do have fans in this city!! There are quite a few of us at my work that check your blog religiously for your Bachelor/Bachelorette updates…and your blog is talked about quite frequently around the lunch room table. I hope the city treats you well! Indy has been amazing so far!